It’s crunch time, and I’m gonna try to get out as many episode reviews as I can before Season 5 premieres. I ended up having more to write about than I expected for Rarity Takes Manehattan, so it’s going to be its own post just like Flight to the Finish. Enough chitchat, it’s pone time! Rarity Takes Manehattan is a really strong Rarity episode, one that rewatching helped me to come to the conclusion that Rarity is my favourite character in the entire series. Didn’t expect it to hold up as well as it did, but it presents a really compelling and significant character conflict with a whole lot of impressive underlying factors in its execution. I love the bustling classy atmosphere of big cities, and Manehattan let me indulge in that. It’s also a perfect setting for Rarity to develop as a character, considering it’s a place she admires the class of, a place where she can find those at the cutting edge of the fashion industry that she’s breaking into and, most importantly, a place that presents her with the antithesis to her Element of Generosity. One day Rarity is going to have to move on from her friends in Ponyville if she wants to follow her aspirations, and MLP is acutely aware of that, but her generous instincts clash with the selfish attitudes that are allowed to flourish in the city, and they bring out her own underlying selfish tendencies as a fame-seeking fashion designer. Yes, Rarity may be the Element of Generosity but make no mistake, she can be incredibly self-centered. If she were the infallible spirit of generosity, it would be an easy feat to overcome a conflict of being a victim to transparent selfishness. That’s part of what makes Rarity so interesting, her desires as a fashionista clash with her true generous spirit. On one level this episode is quite simply a conflict about the power of generosity to overcome selfishness, but beneath that there’s also an underlying narrative of Rarity coming to understand what it means to be an adult. I would argue that the main characters of MLP are in their early twenties by our standards, as they have jobs and quite clearly engage with the adult world but haven’t all quite achieved their own career aspirations. Rarity is on the cusp of making it in the fashion industry but still isn’t quite there yet. Overcoming Suri’s selfish act of stealing her fashion designs and taking credit for them (which was led into quite well with Rarity only just barely making it to the fashion show on the first day and having to present last) was in essence overcoming the fact that there’s bad people in the world who will try to take advantage of your kindness, especially in the dog-eat-dog world of fashion. 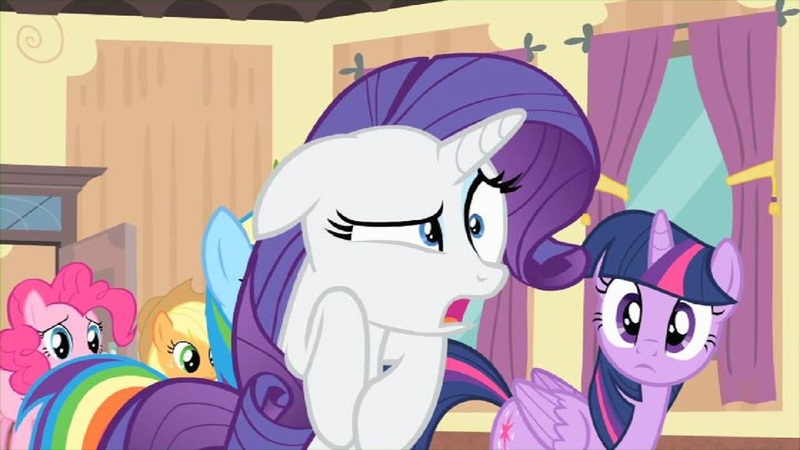 As I said before, MLP is aware that Rarity is going to have to move on from Ponyville to make it in the fashion industry, and though it wasn’t time for her to do that just yet she was presented with that possibility at the end of this episode when she was offered a short-term job in Manehattan. She ultimately gave that job to (the absolutely adorable) Coco Pommel, but she’s now been presented with the possibility of moving on from her friends to achieve her dreams, and I believe that she’ll ultimately have to move on eventually. I know some people would believe it to be absolute gobbledygook to say a children’s cartoon could tackle such mature and poignant themes, but not me. I believe MLP: FiM is a very smart children’s cartoon, and I believe in its potential to have such earnest appeal to adults. Beyond the underlying rich character work and themes of Rarity Takes Manehattan there’s also plenty of elevating neat touches. ‘Generosity’ is a really splendid Sinatra-themed number, and the poignant reprise was a nice dramatic touchstone heading towards the climax of the episode. 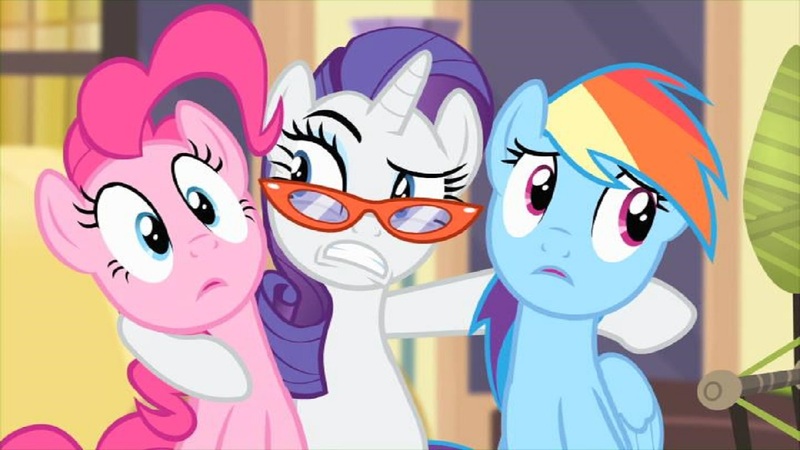 The two most notable vocal performances of the episodes are definitely Prim Hemline, played by Ashleigh Ball with a wonderfully thick and uptight British accent, and Rarity, who Tabitha St. Germain puts in a phenomenal performance with using a natural but massive range from really soft flowing tones (“Stretchy, but not clingy. Shimmery, but not showy.”) to roaring melodramatic freakouts (“Congratu-pony-lations, fillies! Sounds like you’ve all figured out already it’s everypony for herself in this town!”). And yeah, Coco is ADORABLE!!!! I’ll admit I wasn’t absolutely pleased with this episode, though. Rainbow Dash and Applejack had some of the corniest exchanges of any in the entire series, and I don’t like the sense of the main cast not all particularly needing to be there, as is the case with so many Season 4 episodes. But let’s not be cynical, this is a fantastic episode that was an absolute joy to rewatch and to write about. Rarity is without a doubt one of MLP’s greatest creations, and Rarity Takes Manehattan is affirmation of that.